Our soups and salads are made with the freshest ingredients from scratch. 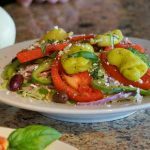 Lettuce, ham salami julienne, feta cheese, green peppers, onions, tomatoes, Kalamata olives & peperoncini. Lettuce, ham salami julienne, mozzarella and yellow cheddar cheese, green peppers, onions & tomatoes. Lettuce, onions, grilled chicken strips, tomatoes, cucumbers, feta cheese & Kalamata olives. Lettuce, onions, green peppers, tomatoes, cucumbers, & carrots. A thick rich blend of vegetables with pasta in a robust tomato broth. A hearty bean soup with vegetables.